Greg Smith is on a mission to make Prince George’s County, Md., a zero-waste jurisdiction. As a co-founder of Community Research, a public-interest research and advocacy group based in College Park, it’s not surprising that Smith has tackled an environmental issue. His group helped set up Zero Waste Prince George’s, which describes itself as 60 or so activists interested in “resource recovery from waste.” Efforts are afoot to build a statewide campaign. But zero waste? Is it even possible? Those who advocate zero waste don’t necessarily expect that every last scrap of trash will be recycled or composted. As Smith explains it, his group seeks to reduce the amount of waste that will be burned or buried by at least 90 percent. Smith laid out the case for zero waste recently when he spoke in microsuburb Edmonston, Md., at the nonprofit Community Forklift, a cavernous warehouse filled with salvaged and surplus building materials offered for sale. Advocates for zero waste define the concept expansively to include not only waste disposal (preferred term: resource recovery) but also a transformative approach to production and consumption of material goods. Based on an analysis conducted by Community Research, Smith said he believes it’s possible for Prince George’s County to recycle or compost at least 90 percent of its waste stream. And at current commodity prices for compost and recycled paper, metals, and plastics, he figures the county stands to lose millions of dollars annually by continuing to landfill its trash. That’s the core economic argument he takes to county officials when promoting zero waste. “If what we’re proposing to them doesn’t work fiscally, it won’t work period,” he said. Recycling and composting also are less polluting and create more local jobs than landfilling or incinerating trash, Smith said. Smith points to the example of San Francisco, where Mayor Edwin M. Lee announced in October that his city had achieved a waste-diversion rate of 80 percent. San Francisco residents use three color-coded waste containers for curbside pickup: blue for recyclables, green for compostable waste, and black for waste sent to a landfill. As it turns out, Prince George’s County and a few other jurisdictions in the Washington area have embraced the concept of zero waste ─ though they might define it in different ways ─ or have moved in that direction with pilot programs to collect food waste separately for composting. Prince George’s County’s six-year Capital Improvement Program earmarks $100,000 to develop a zero-waste strategic plan during the current fiscal year, which began July 1. The money was included in funding for a new $35 million solid waste transfer station at the current site of the county’s yard waste composting facility. Legislation adopted unanimously by the County Council in November established a food composting pilot program and set a recycling goal of 60 percent by 2020. “We can build on these reforms to set Prince George’s County on a path to zero-waste, new green jobs in the resource recovery industry, and a cleaner healthier environment,” said Council Member Mary Lehman, a co-sponsor of the legislation, in a prepared statement. In the District of Columbia, Mayor Vincent Gray’s wide-ranging sustainability plan calls for the city to “send zero solid waste to landfills per year and reduce total waste generation by 15%” by 2032. The plan also envisions reusing 20 percent of all construction and demolition debris, and diverting 80 percent of the city’s total waste through recycling, composting, and conversion. ■ a “pay-as-you-throw” pricing structure for solid-waste collection that charges residents based on the amount of trash they generate. ■ a ban on Styrofoam and non-recyclable plastic containers from food and retail outlets. ■ a container deposit law for all glass and plastic bottles. ■ a requirement that 75 percent of construction and demolition waste be reused or recycled. ■ a three-track waste-collection system, like the one used in San Francisco, that provides each household separate containers for general waste, recyclables, and compostable organic waste. The huge unknown lurking within the zero-waste movement is what role, if any, incineration will play. Burning solid waste is anathema to many environmentalists. Proposals to build electricity-generating “waste-to-energy” incinerators typically encounter robust opposition, including accusations that they release toxic byproducts and are sited in politically disenfranchised poor and minority communities. Despite taking tentative steps toward some version of “zero waste,” neither Prince George’s County nor the District of Columbia has precluded incineration as an option. D.C.’s sustainability plan, for example, is focused on keeping waste out of landfills, ignoring the rigorous no-burn/no-bury definition of zero waste promoted by the Zero Waste International Alliance. The D.C. plan calls for a study of different waste-management options, including “waste-to-energy conversion,” though that presumably could include an innovative technology, such as anaerobic digestion, rather than incineration. Smith fears that Prince George’s County could wind up sending waste to a planned incinerator in Frederick County, Md., or partnering with the District of Columbia to build an incinerator in the nation’s capital. “We would rather Prince George’s County become the site of a regional composting facility than a partner in a regional incinerator,” he said. Incinerators also release greenhouse gases, primarily carbon dioxide, at twice the rate of coal-fired power plants, according to the Environmental Integrity Project. The significance of that finding is controversial, with proponents of waste-to-energy incinerators arguing that much of the carbon dioxide comes from burning plant-based materials such as paper, which derived their carbon from the atmosphere. In this view, the carbon is simply being returned to its original location, so there is no net increase in the atmosphere. Apart from environmental considerations, Smith cites the cost of waste incinerators, which he said can exceed $1 billion for a 1,500-ton-per-day facility. “Ton for ton, incineration is the most expensive option,” he said. The feasibility of waste-to-energy incinerators depends on securing a steady supply of combustible trash, prompting concerns that incineration acts as a disincentive to expanded recycling and composting. That dynamic seems to be at play in Lorton, Va., where the Fairfax County incinerator burns trash from the District of Columbia. Fairfax County sought D.C’s trash business in 2010 to help feed the incinerator and keep it profitable after the recession caused a drop-off in trash from other sources. “[W]e want to operate at as close to capacity as possible,” said Joyce Doughty, director of Fairfax County’s solid-waste division, in a 2010 interview with the Washington Post. The waste-management study called for in the District of Columbia’s sustainability plan will likely determine whether D.C. defines “zero waste” to include incineration ─ an outcome that would undercut the concept of zero waste promoted by Smith and other environmentalists. When Gray, the District’s mayor, set aside $300,000 in December to fund the waste-management study, the D.C. Department of the Environment said the study would focus on “the costs and benefits of establishing a waste-to-energy conversion facility within the District.” That set off alarm among D.C. environmentalists, even without explicit mention of incineration. In a January letter to Gray, more than a dozen environmental groups argued that a waste-to-energy incinerator should not even be considered and therefore it was a waste of money to study such an option. The city’s final solicitation for proposals from consulting firms, issued in March, retreats slightly from the language of Gray’s December announcement. Prospective consultants are told they must develop and compare alternative solid waste-management scenarios with the goal of achieving zero waste “first by producing less waste through reuse, recycling, and composting and then with what waste that remains capturing value from energy production.” Incineration is not explicitly mentioned as an option, nor is it foreclosed. Hallie Clemm, deputy administrator of D.C.’s Solid Waste Management Division and a key player in the city’s approach to zero waste, has expressed a grimly pessimistic view of the potential for recycling. Speaking at a January forum organized by the D.C. Environmental Network, she said her own study of the city’s residential waste stream showed that no more than 35 percent can be recycled. “After you’ve recycled it all and you’ve composted it all, and you’ve reduced what you can reduce, and you’ve gotten people not to buy as much and throw out as much, there is still a bunch of stuff that needs to be handled,” Clemm said. Tackling a frequent objection to incineration, Clemm said that modern mass-burn incinerators are far less dirty than those of an earlier era. “There’s been a lot of regulation that has been put into place that has made this a much cleaner way to go,” she said. Ultimately, political realities make it unlikely that a waste-to-energy incinerator will be sited in the District of Columbia, according to Chris Weiss, executive director of the D.C. Environmental Network. Although the idea has been circulating in the Department of Public Works, the prospect of a D.C. incinerator probably lacks support elsewhere within the executive branch or on the City Council, he said. “I think in the long run it’s not going to happen,” Weiss said. For his part, Smith remains optimistic about the feasibility of his zero-waste vision for Prince George’s County ─ meaning no incinerator in sight. In an interview after his talk at Community Forklift, he even considered the possibility of going beyond the standard 90-percent benchmark for diverting solid waste from landfills or burning. He was asked if 100 percent is possible. Wayne Savage is the owner of Mid-Atlantic Litter Cleanup Service, a Washington, D.C.-based public space litter-removal company. His background includes one summer as a garbage collector for the Columbia, Mo., Public Works Department. There is one reader comment to this story below. Litterblog was on the scene at the D.C. government’s fifth annual “Truck Touch” event June 16 at RFK Stadium, where big rigs from city agencies were available for inspection and horn-honking. Should have brought our ear plugs! The fire trucks had the longest lines, of course, but your litter blogger headed straight for the equipment that cleans our streets and storm drains. First up was the Stetco catch-basin cleaner, which looks like a dump truck with a boom attached. 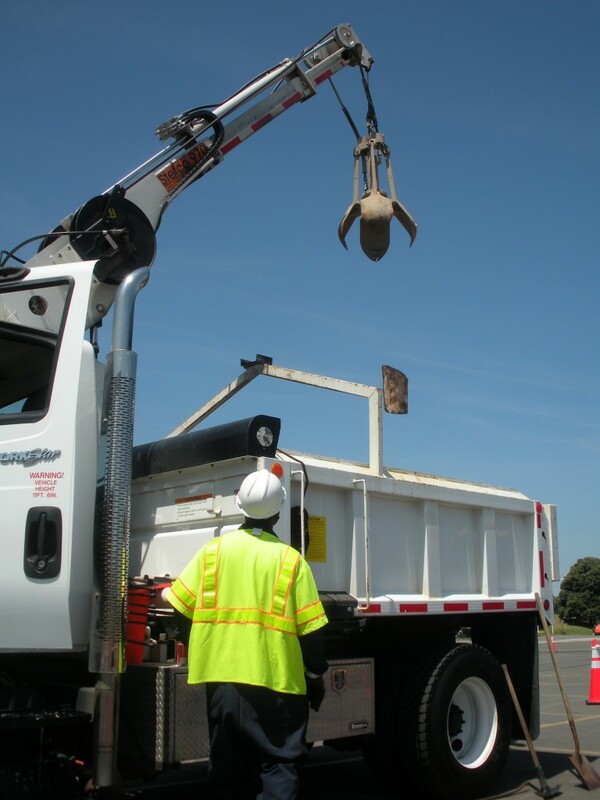 At the end of the boom, suspended by cables, is a clamshell bucket that’s narrow enough to slip though a manhole cover and grab whatever debris are in a catch basin. Otherwise known as storm drains, catch basins usually are built into street curbs, where they gather rainwater and trash that washes off the pavement. 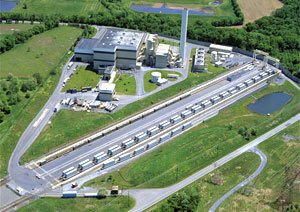 From there, the water flows through pipes to rivers and streams or to the Blue Plains sewage-treatment plant. Though an essential feature of the urban infrastructure, catch basins rarely are noticed unless they become clogged with debris, causing street flooding. D.C. has more than 25,000 catch basins, according to DC Water, which fields a fleet of catch-basin trucks, each with a two-person crew, to clean the basins once a year. DC Water, formerly known as the D.C. Water and Sewer Authority, states that 23 tons of debris are removed from the catch basins every day. The cleaning schedule rotates among various sectors of the city, with crews currently working on the catch basins in the vicinity of South Dakota Avenue N.E. At the June 16 event, I met Kevin Cockrell, a DC Water veteran who has been operating a catch-basin cleaner for 11 years. I asked him to identify the most common article found in the basins. Even when trash cans are available on the sidewalk, Cockrell said, people still put their trash in the basin. To demonstrate his prowess with the catch-basin cleaner, Cockrell clamped onto a single green plastic bottle with the Stetco’s bucket, lifted it up and gingerly placed it in a standing position on top of his truck. A crowd of onlookers applauded. Cockrell said he’s seen fewer plastic bags in the catch basins since D.C. imposed a 5-cent bag fee in January 2010. “[N]o one wants to pay the 5 cents, and that’s definitely getting lighter,” he said. Cockrell finds that most catch basins hold at least some water, even during the dry summer months. After cleaning the catch basins, Cockrell tosses in some mosquito-control pellets to prevent growth of their larvae. In Cockrell’s telling, each basin has its own story, and you never know what you might find inside. Sometimes criminals toss guns into the catch basins in an effort to hide evidence. DC Water crews have aided police on more than one occasion by cleaning out a basin and sifting through the debris for a weapon. Then there is the lore of truly odd ­― and disturbing ― discoveries. “They say in the ’70s someone found a finger,” Cockrell said. Yikes! I thanked Cockrell for his insights, then headed over to the giant orange Elgin street sweeper. You’ve no doubt seen D.C.’s mechanical street sweepers in action. Two observations: (1) The outward appearance of Elgin’s three-wheel Pelican model hasn’t changed much since the 1950s, and (2) it’s rather goofy-looking, as if designed by a committee of drunken cartoonists. Mike Moylan, with Maryland Industrial Trucks Inc., was on hand to talk about the street sweepers he sells to the District of Columbia, his largest customer. He said D.C. has a fleet of 35 street sweepers, including two that run on compressed natural gas (CNG). The street sweepers range in price from $150,000 to about $300,000, with the CNG sweepers costing about $100,000 more than traditional diesel sweepers, although the cost of diesel rigs is increasing as they are upgraded to comply with clean-air standards, according to Moylan. 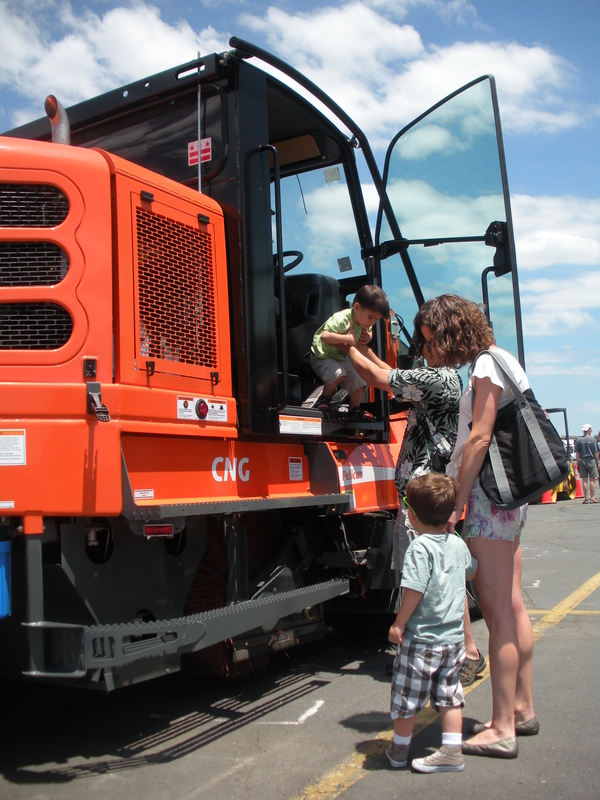 Children enjoy a close look at an Elgin street sweeper during the fifth annual "Truck Touch" event at RFK Stadium. As a steady stream of parents hoisted their kids into the cab of the CNG sweeper on display, I talked with Paul Sneed, a D.C. Department of Public Works employee who has been driving street sweepers for 10 years. Describing his work week, Sneed said he cleans established routes Monday through Thursday, then joins other sweepers on Friday to clean designated “hot spots” as needed. Sneed said he may cover 40 miles a day in his sweeper, including travel to and from his cleaning route. The sweeper’s maximum speed should be no more than 5 to 8 miles per hour when cleaning, Sneed said. Sneed said his major concern is not hitting anyone with the street sweeper. The big rigs have large windows for visibility, multiple mirrors, and, on the newest CNG models, a video camera in back. Some D.C. streets are designated for weekly sweeping, with a requirement that residents move their parked vehicles away from the curb for a few hours. That’s better for the street sweepers, Sneed said, “because it’s easier to clean in a straight path than cutting in, cutting out” around parked cars. When the sweepers cut out from the curb, he said, they often drag along some of the trash and it doesn’t have a chance to work itself into the sweeper’s hopper. The hopper can hold 3.5 cubic yards of trash. When it’s full, the operator raises the hopper to drop the accumulated trash into a dump truck. Streets are swept in the District of Columbia only from March 1 through October 31 because the cold temperatures of winter months could freeze the water that sweepers spray onto the streets, causing hazardous conditions. Wayne Savage is the owner of Mid-Atlantic Litter Cleanup Service, a Washington, D.C.-based public space litter removal service.